So every parent tells other people the funny things that their kids say. Well, at least it’s funny to them. Or the people who know the kid really well. Or people who are easily amused by “kids say the darndest things” type conversations. She buries her face in a chair and sobs even harder. “YOU DON’T HAVE ANY OPTIONS!” the moosh’s closing line to an argument with a fellow three year old. “Stop doing the lawn!” Said to the landscapers outside our window. My life is rarely ever boring. Especially now that I know that little black square up there is a webcam. Who knew? You guys are just too cute. midwestmommys last blog post..I am not mean on purpose…ok maybe just a little. LURVE. And that little tiny shoe! What on earth?! BEAUTIMOUS. Let’s talk about how you’re not allowed to be Cinderella. My little nephew was talking about how much HE wanted to go to the park. Truly. My stepmom heard it. I think she almost pooed. Love toddlerisms. I love those shoes! I wonder if Target has them in my size? You think? Something about the things kids say makes my bladder leak worse than when I was pregnant. I totally bought a flamingo pink computer yesterday with a webcam. I’m thinking we’re going to need to have some webcam fun in the upcoming future. And about the Moosh? I have a terrible hunch she’s going to be very much so like her dad. Olivias last blog post..Remind me again why I went into accounting? 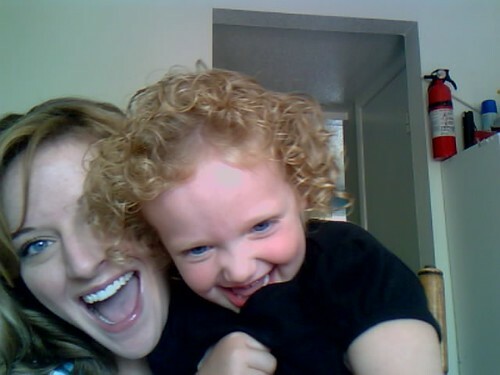 My not-quite-four-year-old daughter knows how to open Daddy’s computer, find and click on the photobooth icon, and take an untold number of pictures of herself. He regularly comes home to find another 50 variations on some silly face or pose. Sometimes they’re of her brother. Sometimes it’s even the cat. I can’t wait for Maddie to talk. 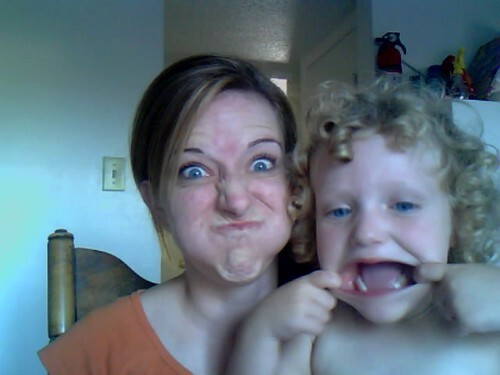 She’s my kid, so craaaaaazy stuff is sure to come out of her mouth. I really think you both are too adorable for words. Well, at least you’re a sister and not the evil step-mama. And that shoe is the most beautificus thing EVER, and you can tell Moosh we all love it. Oh, last thing, either you photoshopped the crap out of it or you have the softest looking feet ever. Jealous! The shoe is TOTALLY You! I think you should get some in your size. And I have the little black webcam too but am afraid to figure out how to use it. She is just toooo adorable! Rachaels last blog post..It’s Saturday. Here’s something for you to read. Those are the kinds of kid comments that ANYONE can appreciate. Keep writing them down. Believe it or not, you forget them. Anissa-Nope no Photoshop. I have foot issues. I treat them like royalty. I danced for over a dozen years and need to make it up to them. I use True Blue Spa “Toe the Line” scrub with a pumice and I put TBS’s “Heel of Approval” cream on every night. What randomly comes out of our children’s mouths is either our payday or punishment for being their parent. …lately, laughing has been my paycheck. Ok, I was seriously loving those shoes until I scrolled down and saw the extra piggies hanging out (Oh,and the rhinestone). But otherwise…adorable! Well, I’m not so sure it’s BOTH parents who can’t be the “cool” characters, but certainly mommies get a bad rep. When my daughter was younger, she use to assign us characters from Winnie the Pooh. My husband was always the lovable bear, stuffed with fluff. Me? Rabbit! The grumpy, obsessed-with-order grouch of the bunch. Nice. I always enjoy when my three year old screams, as I take him away from something he’s enjoying, so that everyone looks at me and thinks I’m kidnapping him or something!! i love mooshisms. she’s awesome. and ps. sometimes i try to sell my son at TJ Maxx…so you *might* get lucky one day! No way. A webcam? Are you sure? Cuz I need to know how to disable it right this minute!!! the moosh is so adorable i can’t even stand it. I can’t believe TJ Maxx doesn’t sell baby brothers!! They have everything else!! Love the curlies. What a cutie! “Drizella!! !” My oh my, but that was a funny thing to read. Thanks for the laugh. Camilles last blog post..My Year in Review: Happy Birthday, Little Blog! Wow, the Moosh kinda made me want to eat a bug she made them sound so delectable. Oh and those curls are to die for! I hope the moosh doesn’t mind that I might just steal her mooshism of “toasty” It’s the perfect description of a brown bug. She’s gonna be a writer! Don’t even get me started on the roles I’m forced to play – if I have to be “the bad baby” again, I’m gonna scream. motherbumpers last blog post..what red, white, and scared all over? New blog look? Come on, I don’t handle change well. But it looks good, at any rate. Oh just wait. I have to be a fairy, or a unicorn, or watch my son play with cars until my eyes bleed! It only gets better with time. I hope my hypothetical children are at least half as cool as the moosh! P.S. Thanks for the comment last week. You made my day! Tylers last blog post..How much does the receptionist know? Oh heavens! Don’t ever look at my feet, Casey!! I like the new look of the site! And you can take pictures from a web cam?? I need to look into this. AAAAAGGGHHHHH! For a second I thought I was on the wrong page! I don’t know how I feel about the change AAACK! Breathe, breathe… ok, I’ll be alright. Love your new look!!!! It looks so professional! Ha ha ha! I am so teaching Elliot how to say “You don’t have any options!” That was awesome. And I’m a wicked stepmother too! Maybe we can form some sort of club. And I LOVE the new site design. Pretty impressive from the girl I remember hyperventilating over her self-hosting last year. You rule, girl. ROFL Those are the funniest mooshisms I’ve read! I laughed at all of them! Your Moosh is hilarious!! i just lurve the both of you!!! these are some seriously great mooshisms! I love these photos….so sweet and happy.